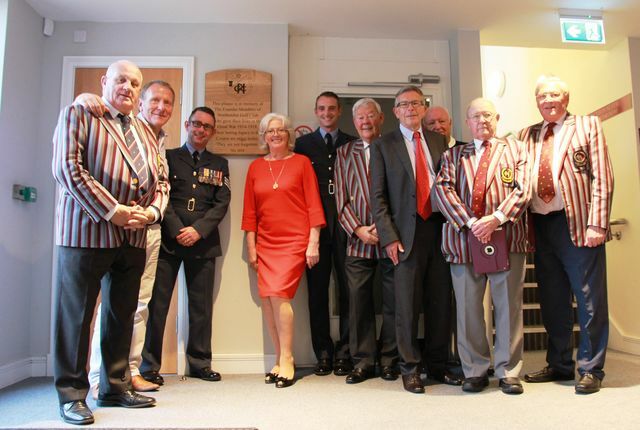 A new War Memorial Board commemorating the Northenden members who lost their lives in the First World War was unveiled after a Charity Day in aid of Prostate Cancer and Help for Heroes on Friday, September 21. 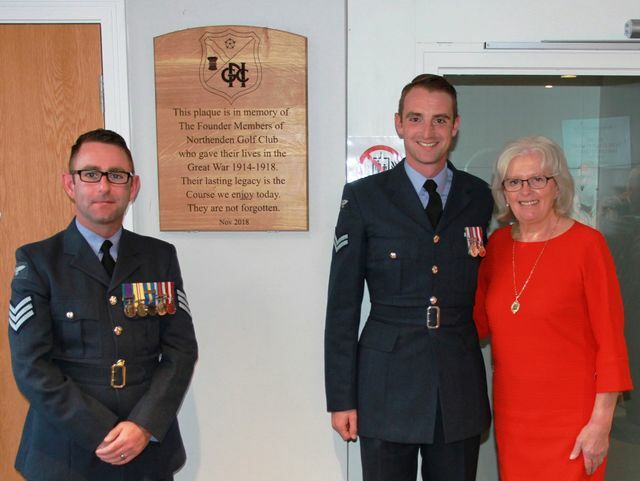 Lady Captain Kate Turpie was the driving force behind the new Board which is now in the clubhouse entrance hall. And she was helped on the day by the 500 Club and the Stockport Lamplighters Rotary Club. "The original board was lost in the clubhouse fire", said the Lady Captain. "I felt that the club should have a new one and I must thank everyone who rallied round and helped me achieve it." Clyde Raine, President of the Rotary Club, was " delighted to lend support and help the club and everyone involved in making it possible. I was glad though I stayed in the club as competitors in the golf tourney had to brave the difficult conditions." Members of the Air Force and Army took part in the golf and were resplendent in full uniform at the opening ceremony. Winners on the course were Carolyn Patton, Mark Patton, Emmy Burgess and Phil Burgess in the Mixed competition with 81 points and the Northenden quartet of Vice Captain Andrew Taylor, Mike Earley, Ged Burke and Tom Smith in the Men's with 89 points.